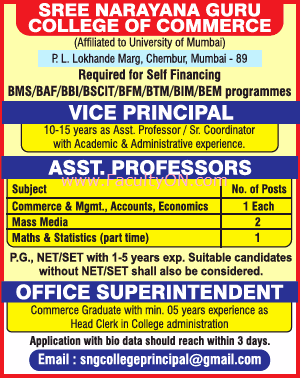 Sree Narayana Guru College of Commerce, Mumbai has advertised for the recruitment of Teaching Faculty- Assistant Professor/ Principal jobs vacancies. Interested and eligible job aspirants are requested to apply on or before 24th November 2018 . Check out further more details below. College Profile: Sree Narayana Guru College of Commerce was established in July, 1986 by Sree Narayana Mandira Samiti situated at P.L. Lokhande Marg, Chembur (west) and very close to Chembur railway station and mono rail and many BEST buses are regularly operating at this route serving people coming from different destinations. The College was started to serve the local student community who were otherwise by and large deprived of higher education. The College is recognized by UGC under Sections 2(f) and 12B of UGC Act and it is a Malayalam Linguistic Minority Institution.